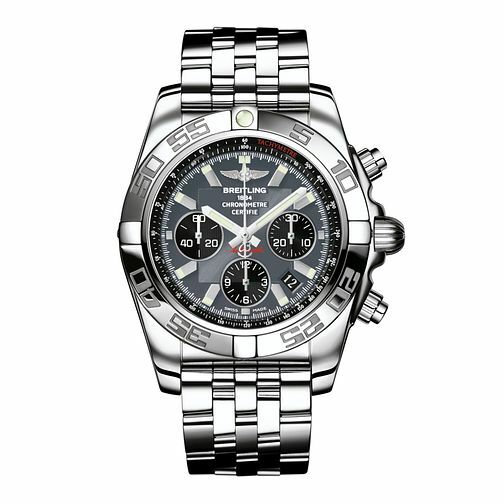 The Breitling Chronomat stainless steel bracelet watch is a meticulously engineered prestige timepiece, featuring chronograph set on a grey dial with luminescent sword shaped hour and minute hands, and date display between the 4 and 5 o'clock positions. The Breitling logo sits at 12 o'clock, and the bracelet is fastened with a sturdy deployment clasp. Specialists in technical timepieces, Breitling originally designed certified chronometers primarily for aviation.